Played on original instrument 1769 by M Kramer. It is not my intention to write an analysis of the Eight Suites for Harpsichord and the other works on these two CDs. The programme notes provide a brief description of each piece which is extremely helpful in understanding these comparatively unknown works. It is sometimes forgotten that Handel was regarded in his day as being a great virtuoso keyboard player. He had a penchant for improvisation that gained him a great reputation. A large amount of his music for keyboard is believed to have been lost � or was played only once as an extemporization in front of a privileged audience and then forgotten. Shortly after Handel had settled in London he issued the Eight Suites in 1720 although these pieces appear to have been written over the previous decade. Perhaps with regard to then current fashion, the title page was in French � Suites de Pièces pour le Clavecin, Premier Volume. Without allowing this review to descend into a musical history lesson, it needs to be said that the �dance suite� largely derived from France. It was soon established as a set of possible movements which eventually became de rigueur. Most of these are well known to musicians today � Prelude, Sarabande, Courante, Allemande and Gigue. The French suite differed from the keyboard music that was being composed at this time in Italy where the sonata was very much the preferred form for instrumentalists. Handel�s works should not really be compared to Bach�s. 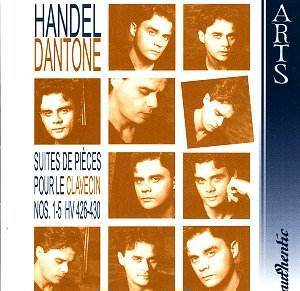 Handel�s Suites are very much products of the humanist era. They are secular works through and through. It would be fair to say that they do not have the frankly intellectual, or perhaps even transcendental, content that so much of Sebastian Bach�s keyboard music has, however they can be enjoyed for their own sake. Handel�s Suites have commanded the attention of �keyboardists� ever since, although I would hazard a guess that they rarely feature in recitals these days. The music is most often to be found in the piano stools of the amateur. 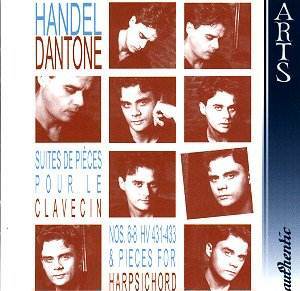 This recording presents us with what is probably the Handelian masterpiece for harpsichord � the Eight Suites. Coupled with this collection are a number of other works that are more stylized and tend toward the Italian School. I suggest that each Suite is listened to as a separate work. Do not just put this CD on the player and sit back with the Times crossword; each Suite well deserves to be considered as a separate entity and enjoyed in its own right. I must confess that I do not know the playing of Ottavio Dantone so perhaps a few comments are in order. As a young man he studied both organ and harpsichord at the Milan Conservatory. Since then he has devoted most of his life to the perusal of early music � both as a theoretician and a player. He is noted for his contribution to the study of �basso continuo� which serves him well in the realization of chamber music. He spends much of the year in giving recitals on the harpsichord and fortepiano, working as soloist and with chamber ensembles. He has travelled extensively in the United States, the Far East and Europe, giving recitals in all the main musical venues. His growing catalogue of CDs includes works by Vivaldi, the Forty Eight, Scarlatti and Purcell. What I have particularly noticed in his playing on these two discs is the apparent scholarship which underlies his interpretation of these dance suites. He is able to create a tremendous variety of tonal quality and voicing on the harpsichord which leads to continual interest for the listener; it never palls on the ear. The ornamentation does not appear to be over fussy. A balance is struck between a sense of great energy and a kind of laid-back approach which does not try to makes these pieces into an Italian opera! There are a few other versions of these Eight Suites. The one which I know best is the EMI (69337) release with Sviatoslav Richter and Andrei Gavrilov plus the next �eight� between them. Of course the piano is my instrument, so I love the �fluency and sensitivity� of this edition. However I am not sure that these works transfer to the piano as well as Bach does. For example the Chromatic Fantasia and Fugue by Sebastian Bach has a kind of timeless quality about it that seems to me so perfectly suited to a modern concert grand piano as well as the �original� instrument for which it was composed. The Handel Suites do not transfer so well away from the harpsichord. I say this with a little reservation as I have long enjoyed playing these works on the piano! The other benchmark edition of these Suites is on Hyperion (CDA 22045) with Paul Nicholson as soloist. Included on this recording are the Six Fugues or Voluntaries for Organ or Harpsichord and two other fugues. The sound quality on this present CD is excellent and allows the detail of the playing to be clearly heard. Unfortunately the CD covers are a little �iffy�. I am not sure I like nineteen moody studio photographs of the instrumentalist staring at me. In fact it is one of those covers I would flick past if it were in a browser � it looks a bit cheap. However, artistic design of the CD cover is not everything. I feel that the present recording by Ottavio Dantone compares favourably with the Hyperion release � at least for the Suites. It should become a if not the definitive edition.